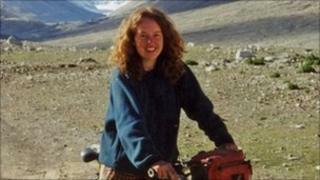 Linda Norgrove, the kidnapped aid worker who died during a failed rescue attempt, has been shortlisted for a posthumous humanitarian award for her "selfless" work in Afghanistan. The 36-year-old from Lewis was abducted in the Kunar province on 26 September. She died on 8 October, during a botched rescue mission by US special forces. She was nominated for the Robert Burns Humanitarian Award, as was Mary's Meals founder Magnus MacFarlane-Barrow and Akshaya Patra's Madhu Pandit Dasa. The award is presented every year to someone who has "saved, improved or enriched the lives of others or society as a whole". The winner receives 1,759 guineas, a sum which signifies the year of the bard's birth and the coinage then in circulation, as well as a specially commissioned hand-made award. Ms Norgrove, a former United Nations employee, was working for the firm Development Alternatives Inc in the Dewagal valley, when she was taken in an ambush. She supervised reconstruction programmes funded by the US government in the eastern region of Afghanistan. The aid worker was initially said to have died at the hands of her captors but it later emerged she was killed by a grenade thrown by a US special forces soldier sent to rescue her. Three local staff taken with her were released unharmed. The Norgrove family set up the Linda Norgrove Foundation after her death, which is aimed at continuing her work. She was nominated for the humanitarian award by Western Isles MSP Alasdair Allan, who said: "I am very pleased that Linda and her family have received this well-deserved recognition for the remarkable contribution which Linda made to helping people in dangerous places around the world." One of the other nominees, Magnus MacFarlane-Barrow, started the charity Mary's Meals in 2002. It provides some 400,000 chronically hungry children from Africa, Asia, Latin America and Eastern Europe with one meal a day in school. Madhu Pandit Dasan set up the Akshaya Patra Foundation, an Indian school meal programme, 10 years ago. It began as a small scheme that fed 1,500 children around Bangalore and now reaches 1.2m children every day. The winner of the award will be announced on 22 January at a ceremony at the Burns Museum in Alloway, Ayrshire. Previous winners include fundraiser Habib Malik, who leads the charity Islamic Relief Scotland, and the Zimbabwean archbishop Pius Ncube.